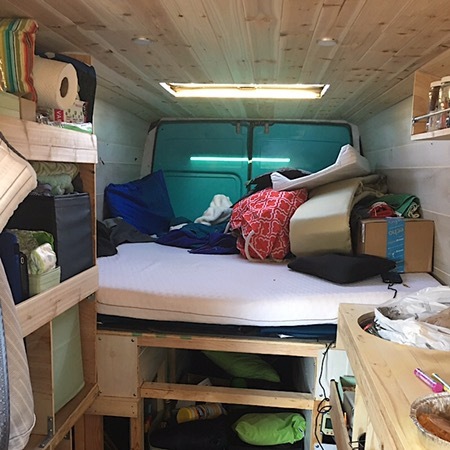 Vanlife Log, day 1. The Van packed in disarray, we pulled out of our suburbian neighborhood to return to vanlife from a six month hiatus. The sun streamed down in the high 70s, as if it had no idea we are in winter. Our belongings bouncing about, we turned right, then left, and on towards the highway. Vanlife staycation is fully in effect. Although I am a bit insane about order, the mess did not bother me. It was all here, everything we need is in the van. There will be plenty of time down the road to play the rearrange shuffle. And I’m sure to play it more than once. We pretended today was just like any other day. Returned a few things to Costco, stopped for baby’s doctor appointment, and let the pup jump at a tree in the parking lot. The Husband sat on a conference call in the van while I walked across the street to grab us a coffee. The shop had closed two hours earlier, but the owner happened to be there, and offered to make us coffee anyway. A simple kind act that gave me a glimpse of that “good” in life, that we constantly seek to find. Five hours had passed since we hit the road. We were only 40 min outside of our town, but felt no need to hurry. There was a silent excitement in the air. Free of packing, planning, and schedules. Wherever we go, now, we will never have to hurry home. Home is already with us, and we are officially back on the scenic route of Vanlife.